i still have some kl-related posts to do, but i just wanted to thank miss judith for sending me a bottle of the limited-edition marmite with champagne. anthony says it's got a touch of that you've-got-chocolate-in-my-vodka gainsbourg/birkin pairing about it; i'm more than inclined to agree. i have yet to taste it. my brain says this should be the best thing ever, but i wonder if the combination might be such a freakishly amazing idea that the actuality might'n't live up to my expectations. kind of like baby charlotte here. love mom and dad, but the resulting offspring? an interesting combination to be sure, but it has taken some time to truly appreciate her. which i wholeheartedly do. 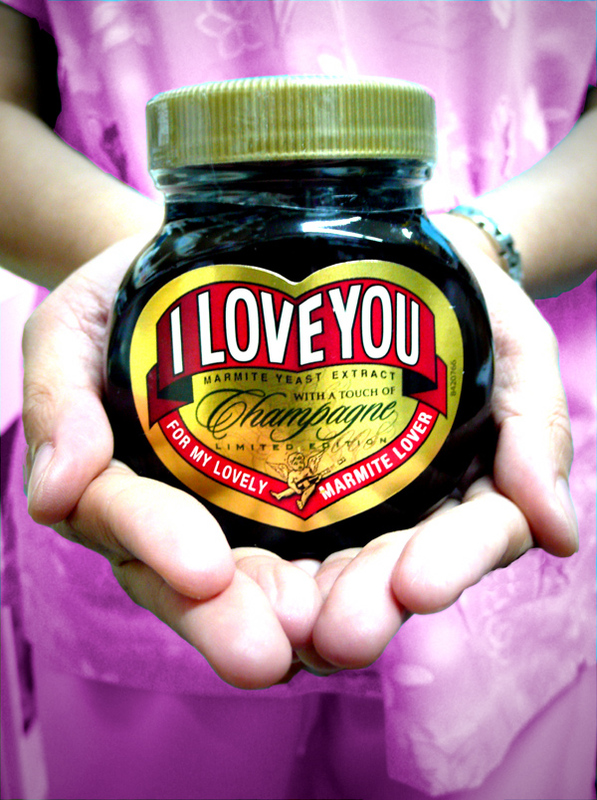 marmite with champagne, i am prepared! a little pick(le)-me-up in kl. all it took was one whiff of that pungent vinegar scent to lure us in. 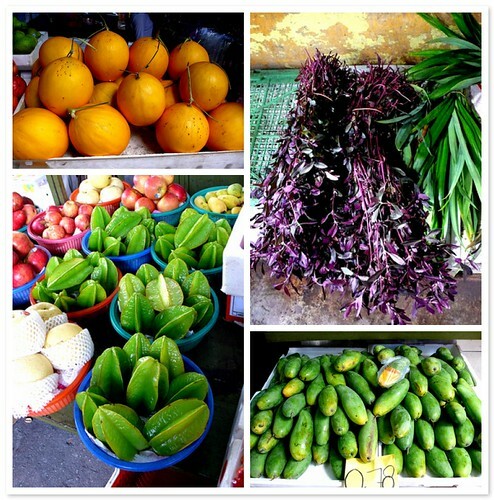 it was difficult to decide what to pick, without getting overloaded: there was the familiar green mango, yellow mango, and papaya, the unfamiliar-as-a-pickled-substance green grapes, yellow peach and surinam cherries, and the purely unfamiliar salak (snake fruit) and asam kelubi. 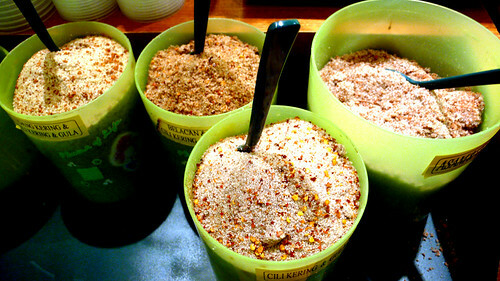 luckily, we could pick our mix at whim, and return the day. 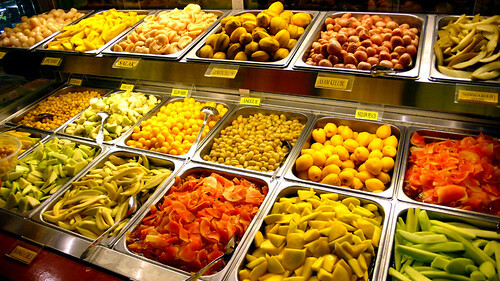 also available were a variety of rojak sauces and salty, sweet, spicy, stinky concoctions to dip the fruit in: salt and sugar, salt and sugar and chili, salt and sugar and chili and shrimp paste. we didn't have these as kids, which is a shame. i didn't get a chance to sample anything too whiffy, but there's always hope for next time. well of course i had to go to a market. 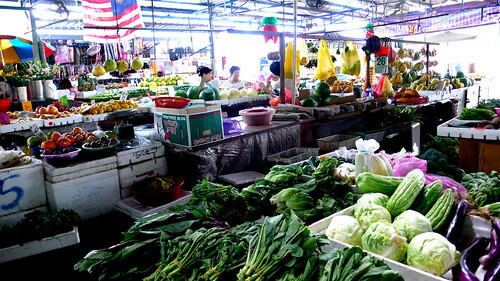 i went to imbi market, which i had read about on boo's blog, and in the inaugural issue of time out kl, in an article written by eating asia's scribe, robyn eckhardt. our hotel provided complimentary breakfasts (pretty good as far as hotel buffets go), so unfortunately, i didn't go to sample the famed hainan coffee and roti kahwin, just to poke around a bit to see what kinds of fruits and veg were on offer, maybe peek into the wet market (or maybe not), and check out the stalls. i was v. tempted to bring back some of the beautiful dried seafood on offer--cuttlefish, oysters, and scallops of every size--but knew that cute but pesky US customs dog would sniff it out. 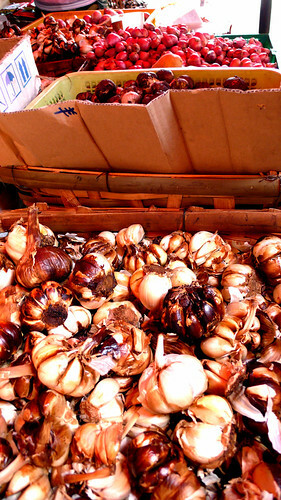 i think, though, with a little experimentation i might be able to recreate the bursting bulbs of smoked garlic, which were offered up in various stalls. don't know exactly what i'd do with it besides a smokin' (literally) pot of tau ew bak, a thick, soy sauce based stew like hawaiian shoyu chicken, only with giant, glistening chunks of pork. mmmmm. so not halal. temptation gave in when i saw the sisters crispy popiah stall. 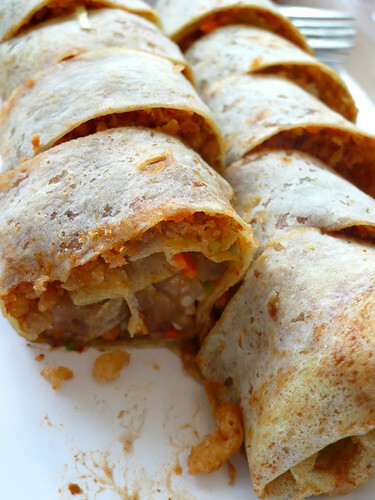 popiah are the regional version of the filipino lumpia sariwa, a savoury rice or wheat flour crepe painted with a sweetish-soy and bean sauce, then filled with fresh vegetables, yam or turnip noodles, prawns, and whatever else to the maker's choosing. i'm not sure why the sisters' version is so lauded, but i wonder if it is the 'crispy' in the name that is unusual; their popiah had a generous amount of batter bits that were indeed very crispy and added lovely texture to the wrap. count me as one of the many fans. i think my favourite vendor, though, was mr. wong, the owner of the chinese pastry stall (name temporarily escapes me, but i'll have a rummage for the card). an earnest and engaging young man, his father and uncle had popular shop in chinatown on petaling street, but he moved the four-generations-old business to the market when his uncle retired. 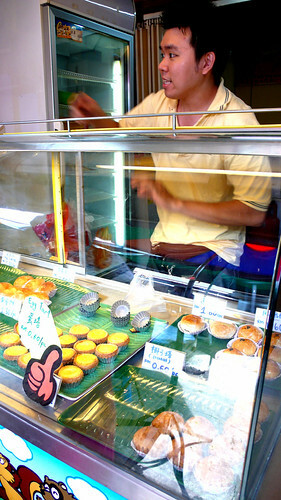 when he saw me taking photos, he showed me his own digital camera, filled with photos of him making the pineapple jam that filled many of the flaky crusted pastries in his case. it takes him four to five hours just to peel the pineapples, never mind cutting and cooking them down in a giant cauldron. 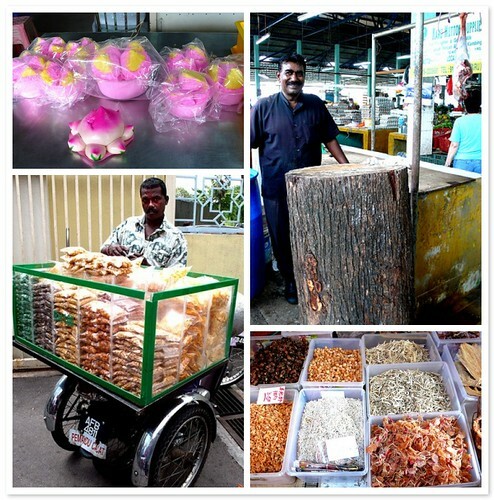 one jam making session makes just enough for four days' worth of sweets, so on top of his duties at the stall, he must go through the day-long process for the jam alone, at least twice a week. it is worth it--the fresh flavour of the pineapple still evident under the caramelization, just a tiny bit tart and not too sweet. 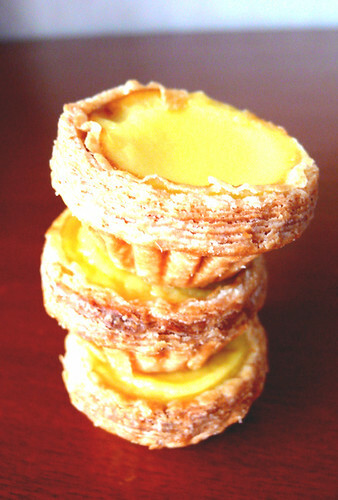 although all the pineapple jam filled pastries were lovely (the one with salted egg yolk and jam was especially interesting), i think his top creation would be the mini-egg custard tarts. 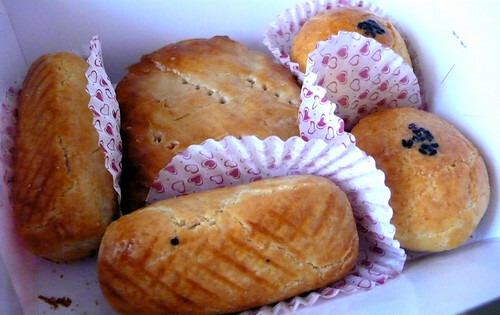 the crust is impressively flaky, with a silky, light egginess within; you can easily eat one or two in seconds flat.